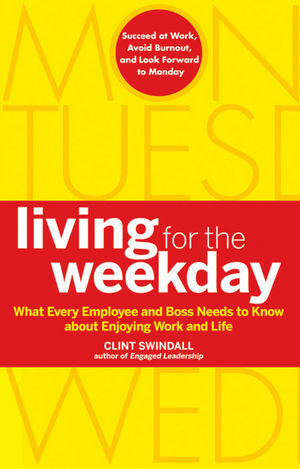 "In Living for the Weekday, Clint Swindall has rounded out a powerful message. Each individual has a personal responsibility, a singular opportunity to be highly engaged as an employee and, more importantly, highly productive and happy in all aspects of life. "—Barry Malcolm, Managing Director, Scotiabank Bahamas Ltd.
CLINT SWINDALL, author of Engaged Leadership, is a nationally recognized expert on leadership development. He is the president and CEO of Verbalocity, Inc., a personal development company with a focus on leadership enhancement. He delivers his inspiring and enthusiastic message of personal and professional leadership as a featured keynote speaker for Fortune 500 companies, government agencies, and trade associations each year. His corporate client list includes American Express, BMW, Hallmark Gold Crown, Valero Energy, Ingersoll Rand, and Keller Williams Realty. You can reach him at Verbalocity's Web site at www.verbalocity.com.